As promised, here is the Easter card I made for the Ranger Ink Booth at CHA this year. 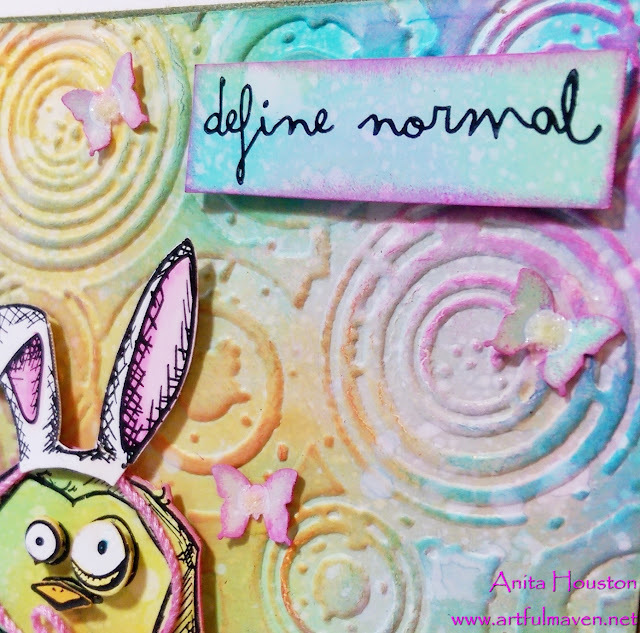 It was made with Specialty Stamping Paper, and lots of Tim Holtz Distress Ink. 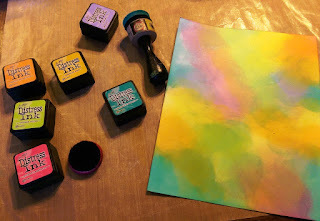 I inked over a piece of Specialty Stamping Paper with a lot of Spring colors. I flicked water over it...truly my favorite way to use Distress Ink. 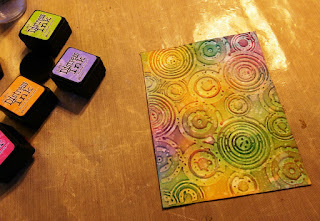 I dry embossed the piece with the Retro Circles Texture Fade, and inked the edges. 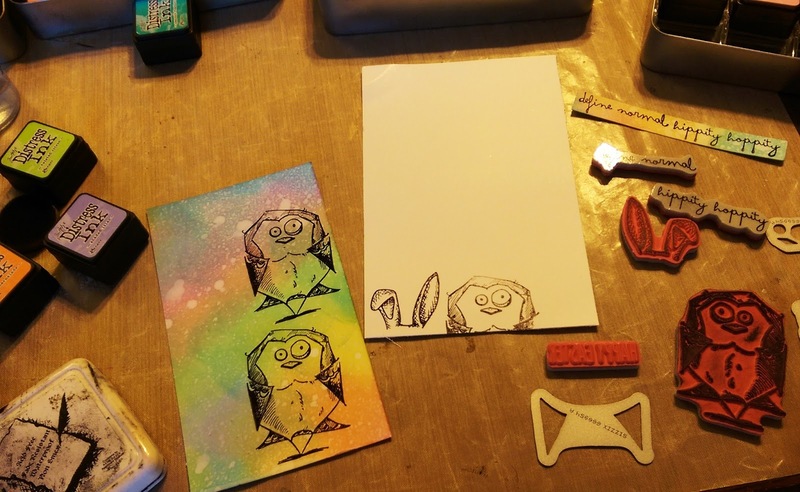 I inked more paper, stamped the birds, accesorory ears, and the egg on it, as well as a clean sheet, and die cut them. The sentiments were inked on the same paper. I die cut the fringe with the Kraft Core too. I colored in the ears with a Tattered Rose Distress Marker. 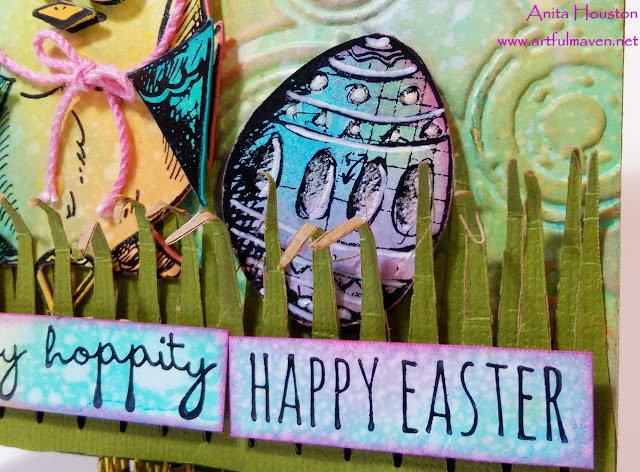 Stay tuned, as I have a few more Easter projects to show you this week. Until then, enjoy your Easter week! This card is absolutely adorable, Anita! Love the colors and embossing folder you used. The crazy bird "bunny" is so cute! Lots of fabulous colour on this great card Anita and I love your bird with his floppy ears. Enjoy your Easter week too. Wow, such a cute Ester card with Crazy birds stamp :) love this. This is still my favorite distress technique, and the colors you used are gorgeous! But what I really want to know is how you got this picture of me from last year after having had one too many Peeps. Bwahahahahaha! Thanks, Beautiful Soul for a really fun project! Hehhehe - cutest 'Bunny Bird' EVER Anita - totally ADORABLE. Smiling big. This is just a DELIGHTFUL creation. The colors - wow - so HAPPY & BRIGHT. Your grass is just WONDERFUL - it's all just sooooooooooo DARLING to me. Thanks bunches for making my day!! j. Such lovely springtime colours and fab texture, and your bunny bird is the cutest! love the colours of this!! 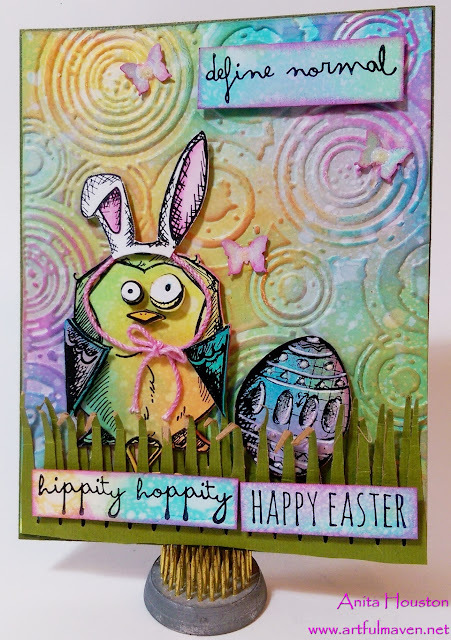 a very happy Easter card!! 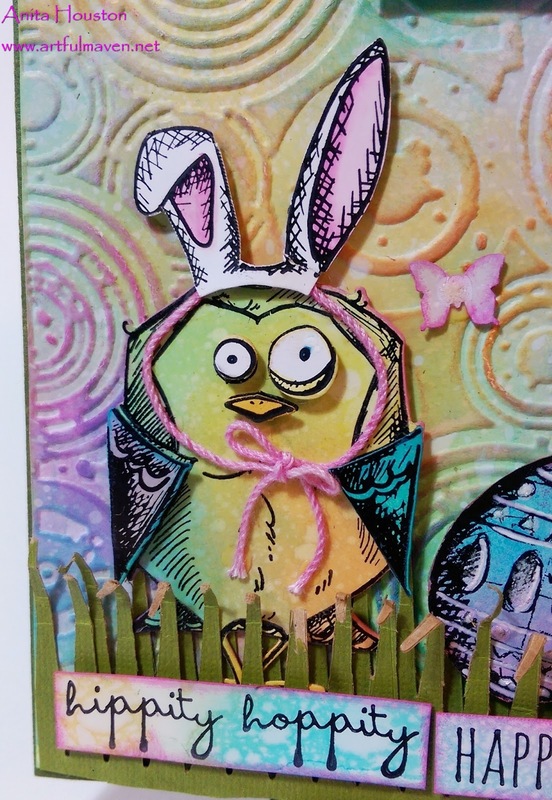 Just love your sweet "bunny birdie" card! So clever to have bunny ears on Tim's bird!!! Love the soft colors and the cool egg, along with the tiny butterflies! That bg is so pretty. 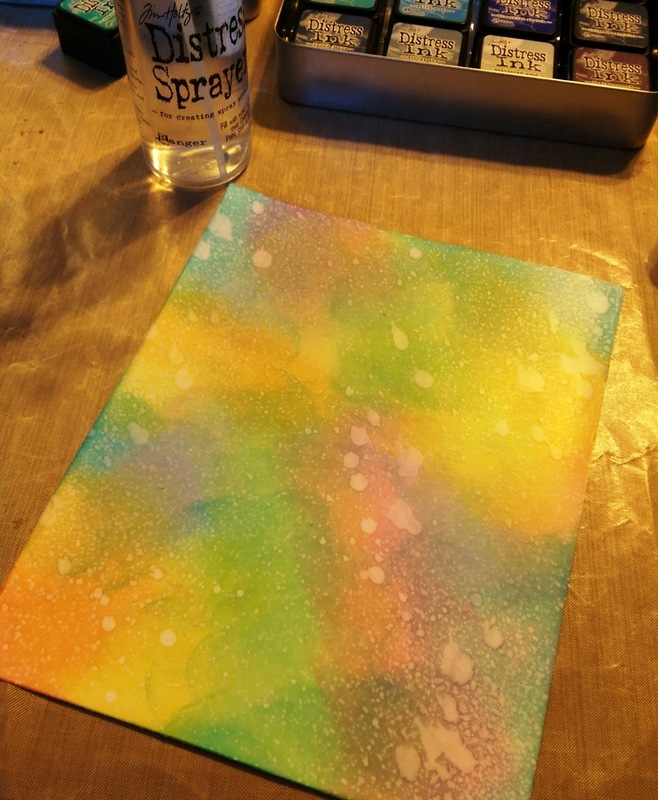 I always forget about flicking water for the cool water spots!!! Thanks so much for the inspiration! Really cute Easter card, Anita. I love the springy embossed background. Those crazy birds are super cute and I love your "define normal" sentiment coupled with their goofy faces. Very clever! so sweet - and I love the raised texture. Wonderful card - I am sure this bunny is on a sugar high! Anita, this is truly darling, how very adorable and fun! Great color work! I love this fabulous card! The colors are amazing and the ears on that bird are so funny, thanks for sharing this piece of genius.